We are counted among one of the most reliable dealers of Access Control Systems. These access control systems are highly useful in keeping a tab on employees attendance in the organizations. We are offering these products into various configurations and specifications, as needed by the customers, that too within the stipulated time-frame. Our range of access control systems includes turnstile access control systems, door lock system, barrier control etc. 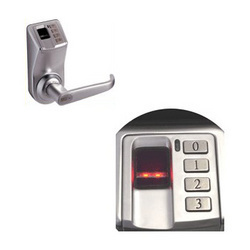 Secure your home or office with the kb1000 fingerprint door lock. This revolutionary fingerprint lock has three different ways for you to grant access. Fingerprint, pin code, or secure key. The kb1000 has a single latch mortise providing easy installation with no need to modify most existing doors. Powered by 4 AA batteries, this lock can be operated for up to a year without changing the batteries. Fingerprint enrollment is quick and easy. 30 users can be enrolled directly on the fingerprint lock at the door. stainless steel tubular single latch mortise - now available in silver finish. State-of-the-art: Heavy duty and durable design. Two ways of unlocking: Fingerprint and/or PIN code. Stainless steel tubular single latch mortise: Easy to install and simple to operate. Fingerprints can be enrolled/erased on the lock directly with lock on door. Adopts optical CMOS fingerprint sensor. Satin brushed stainless steel finish only. All critical parts within inside housing. With normal open status for meeting. Two high security override keys are provided for emergency entry. Concealed mechanical override for emergency. One year battery life under normal use. Outside lever free to rotate in locked mode. Very easy installation and operation. Image capture time: 1 second. 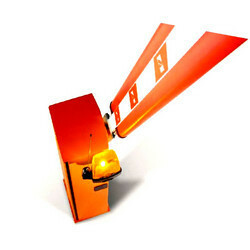 We offer Barrier Control Systems. For more details of Barrier Control, please click pdf attached. We offer Fingkey Access Control Systems. Refined design access control to be released, Fingkey Access Upgraded from specification to performance and simple but luxurious design. 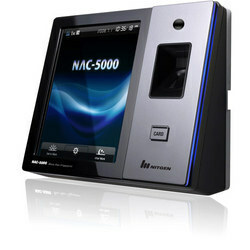 You must experience the next generation of access control from Nitgen. We offer Turnstile Access Control System. 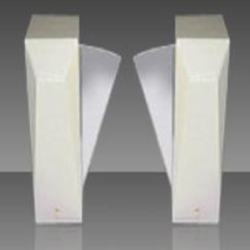 Ensures rapid, efficient & safe access control. Opto-isolated inputs & outputs for interfacing external device. For more details of Turnstile Access Control Systems, please click pdf attached. Elevator Access Control system allow people access to certain floors within a scheduled time frame. Elevator Access Control System can control one or more elevator controllers in a system.Elevator Access Control System provides a range of system authority for users. 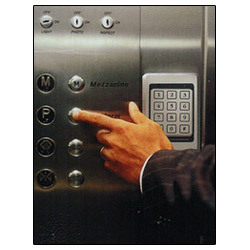 The maximum number of elevators on the system depends on the control panel you choose. Elevator access can depend on the user’s classification, the time of day, which elevator is being approached, and the armed state of a department. In addition, changes to the status of a zone can either cause elevator to grant access to a floor, or cause the elevator to deny access. By using one or more of these attributes, you can create elevator access control policies that are extremely flexible and secure. By using an elevator access control system, you can separate the general public and unauthorizeusers, from users, from authorized users. Note : The Procut price Range Vary from Rs 8500 to 35000.